AmSafe® is the world's leading provider of safety restraint products for the aerospace and defense industries. Most well-known for its aviation passenger seatbelts, it is, in fact, the technology leader in the manufacturing of aviation airbag restraint systems. AmSafe is the first and only company to have a seatbelt airbag system installed worldwide on both commercial and general aviation aircraft. Products are used in both commercial and general aviation, military and civilian applications. Protecting passengers is a priority to AmSafe and its products help move millions of people safely and securely in the air. With manufacturing operations and service facilities around the globe, AmSafe is focused and committed to providing quality products and timely, cost-effective solutions to customers worldwide. "AmSafe products help move millions of people safely and securely in the air." From aviation and defense to child and specialty vehicle restraints, AmSafe's state-of-the-art engineering capabilities can be recognized by the depth and breadth of its product offering. The engagement process begins with a thorough understanding of the customers' requirements. A disciplined program management ensures priorities and activities are tightly controlled. Global engineering capabilities include the latest in CAD techniques and 3-D solid modelling (Catia V5 and SolidWorks), test simulation and material and prototype testing. A special non-linear dynamic analysis package, PAMCRASH, is also utilized that's specific to aviation textile products. From raw textile to finished product, a team of engineers conduct thorough testing, from analysis to documentation, to ensure the safety and integrity of all AmSafe products. Along with dynamic and prototype testing, tensile strength, endurance, flammability, corrosion, smoke, toxicity, susceptibility to fluids and substances, temperature and humidity are also measured, and more. From each of its global locations in United States, United Kingdom, China and Sri Lanka, AmSafe has the design, engineering and manufacturing capabilities to provide customers with the resources necessary to meet their most stringent requirements. In 1955, one of the predecessors to AmSafe, Cummings & Sanders, was granted a patent for a metal-to-metal buckle. The seatbelt industry was born. Through a combination of exceptional internal growth and a few select strategic acquisitions, AmSafe has become the world's largest supplier of pilot, crew and passenger restraints for the aviation market. In 1997, AmSafe developed the first aviation seatbelt airbag system, which took its first flight in 2001, and is now flying on more than 100 commercial airlines and is standard equipment on over eighty-five percent of the world's general aviation aircraft. Continuing with its innovations, in 2006 AmSafe received the first FAA approval for a child restraint system designed specifically for use on airplanes during all phases of flight. AmSafe has a team of professionals who bring a wealth of experience and vision to the entire organization. The management staff is key to making and keeping AmSafe positioned as the world leader, and in maintaining its professional global identity. Together, they strive to exceed the expectations of both customers and employees. AmSafe is attending the LSA Expo, the 15th Annual Event held in Sebring, FL. AmSafe is the world’s leading supplier of aircraft restraint systems, with the most technically advanced restraint safety systems available to help meet your safety requirements. This includes the lightest and smallest rotary buckles available, lightweight 3-point restraints, SOARS and seatbelt airbag systems. Why not meet us at this event? AmSafe is exhibiting at HAI HELI-EXPO – Atlanta, the world’s largest trade show dedicated to the international helicopter community. AmSafe will showcase the latest in restraint technology, including the lightest and smallest rotary buckles available and airbag systems. 2018 AUSA ILW Global Force Symposium & Exposition in Huntsville, AL. AmSafe will be attending the 2018 AUSA ILW Global Force Symposium & Exposition in Huntsville, AL. A three-day event that will include presentations from the United States Army Materiel Command, the United States Army Training and Doctrine Command, and the Office of the Assistant Secretary of the Army. AmSafe designs and manufactures restraints providing survivability solutions to every requirement. Let us assist you with your restraint needs, to provide the best occupant safety system with our broad range of product offerings. AmSafe will be exhibiting at Aircraft Interiors Expo, the world’s leading event for airlines and the supply chain to source the latest innovations, technologies and products for the cabin interiors, inflight entertainment and passenger comfort industries. 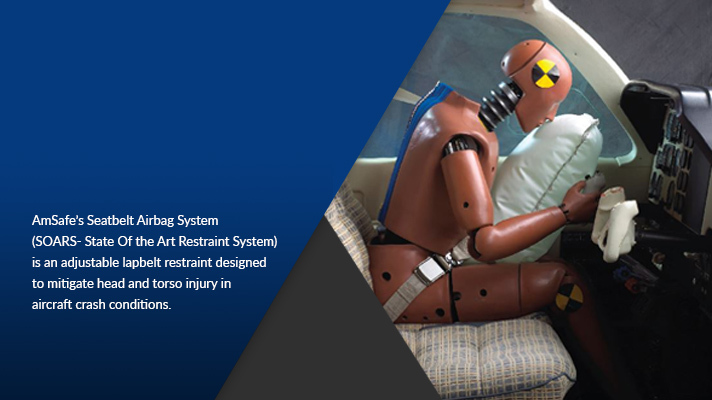 AmSafe will showcase the latest in restraint technology, including the lightest and smallest rotary buckles available, lightweight 3-point restraints, bulkhead airbag, seatbelt airbag and structural airbag systems. AmSafe will be attending the Sun ‘n Fun International Expo, The annual event, held in April, has grown into the second largest event of its kind in the world and is Florida’s largest annual convention. AmSafe is the world’s leading supplier of aircraft restraint systems, with the most technically advanced restraint safety systems available to help meet your safety requirements. This includes the lightest and smallest rotary buckles available, lightweight 3-point restraints, SOARS and seatbelt airbag systems. AmSafe will be exhibiting at MDEX which provides opportunities for government and industry to come together to deliver the best tools and services to the warfighter. AmSafe will be attending the AAAA, the only opportunity for the entire army aviation community to gather in one place at one time, focused solely on Army Aviation issues. AmSafe designs and manufactures restraints providing survivability solutions to every requirement. We will be exhibiting the latest technology in seat belts, multi-point buckles and our latest development in seat belt air bag restraints. Let us assist you with your restraint needs to provide the best occupant safety system with our broad range of product offerings. AmSafe will be attending the Dublin Aviation Summit, which brings together Global decision makers from leading MROs, Financial Sectors and Asset Managers from across the industry. AmSafe is the world’s leading supplier of aircraft restraint systems, with the most technically advanced restraint safety systems available to help meet your safety requirements. This includes the lightest and smallest rotary buckles available, lightweight 3-point restraints, bulkhead airbag and structural airbag systems. Panair will be exhibiting at the CCMA. A premier annual maintenance and technical purchasing conference focusing on four key industry pillars – innovation, technology, efficiency and regulations – in order to develop effective solutions that maximize aviation’s economic and social footprint in the region. Panair is the exclusive representative of AmSafe in Latin America. AmSafe is the world’s leading supplier of aircraft restraint systems, with the most technically advanced restraint safety systems available to help meet your safety requirements. This includes the lightest and smallest rotary buckles available, lightweight 3-point restraints, bulkhead airbag, seatbelt airbag and structural airbag systems. Contact your AmSafe or Paniar representative to arrange a meeting. AmSafe will be attending SOFIC. The Special Operations Forces Industry Conference is the premier venue for the SOF community to interact with industry and to collaborate on the challenges, initiatives and way-ahead in delivering the most cutting-edge capabilities into the hands of SOF operators. AmSafe designs and manufactures restraints providing survivability solutions to every requirement. Let us assist you with your restraint needs to provide the best occupant safety system with our broad range of product offerings. AmSafe will be attending the AP&M Europe which gathers the entire airline supply chain under one roof, with over 200 industry suppliers displaying their products and services to over 4,000 aviation professionals. AmSafe is the world’s leading supplier of aircraft restraint systems, with the most technically advanced restraint safety systems available to help meet your safety requirements. This includes the lightest and smallest rotary buckles available, lightweight 3-point restraints, seatbelt pretensioners, bulkhead airbag and structural airbag systems. AmSafe will be attending Eurosatory, the event where you can meet all the Defence and Security industries from all over the world. Meeting high Level exhibitors and visitors whilst discovering new products and trends. Supraero will be exhibiting at the Paris Airshow. The largest meeting of key industry professionals in the aviation calendar, where a long history rich in pioneering heritage meets cutting edge technology. AmSafe is the world’s leading supplier of aircraft restraint systems, with the most technically advanced restraint safety systems available to help meet your safety requirements. This includes the lightest and smallest rotary buckles available, lightweight 3-point restraints, bulkhead airbag and structural airbag systems. AmSafe will be exhibiting Oshkosh which has evolved from a small gathering of aircraft and aviators into a premier aviation event known the world over. AmSafe is the world’s leading supplier of aircraft restraint systems, with the most technically advanced restraint safety systems available to help meet your safety requirements. This includes the lightest and smallest rotary buckles available, lightweight 3-point restraints, SOARS and seatbelt airbag systems. Panair will be attending LABACE, the largest business aviation event in Latin America. Panair is the exclusive representative of AmSafe in Latin America. AmSafe is the world’s leading supplier of aircraft restraint systems, with the most technically advanced restraint safety systems available to help meet your safety requirements. This includes the lightest and smallest rotary buckles available, lightweight 3-point restraints, bulkhead airbag, seatbelt airbag and structural airbag systems. Contact your AmSafe or Panair representative to arrange a meeting. AmSafe is exhibiting at the ACPC in Washington Dc, the most productive aviation conference and networking forum in the calendar, bringing together suppliers and airlines from around the world. AmSafe will showcase the latest in restraint technology, including the lightest seatbelts, smallest rotary buckles available, and innovative airbag systems. Panair will be attending SNAA, the event that brings together the best of Agricultural Aviation, products, services, information and technologies. Panair is the exclusive representative of AmSafe in Latin America. AmSafe is the world’s leading supplier of aircraft restraint systems, with the most technically advanced restraint safety systems available to help meet your safety requirements. This includes the lightest and smallest rotary buckles available, lightweight 3-point restraints, and seatbelt airbag systems. AmSafe will be attending AUSA, the U.S Army’s professional association. The Meeting is the largest landpower exposition and professional development forum in North America. Taking place over three days, the Annual Meeting is designed to deliver the Army’s message by highlighting the capabilities of organizations and presenting a wide range of industry products and services. AmSafe designs and manufactures restraints providing survivability solutions to every requirement. We will be exhibiting the latest technology in seat belts, multi point buckles and our latest development in seat belt air bag restraints. Let us assist you with your restraint needs to provide the best occupant safety system with our broad range of product offerings. AmSafe will be attending SAFE annual symposium. Composed of Government, Military, Industrial, and Academic interests, SAFE represents aviation, space, land, and marine safety disciplines for the protection of users worldwide. AmSafe will be attending MRO Europe, the premier event in this region for the commercial air transport maintenance, repair and overhaul industry, designed for you by thought leaders and innovators from the leading and trusted brand in the aviation/aerospace industry. AmSafe is the world’s leading supplier of aircraft restraint systems, with the most technically advanced restraint safety systems available to help meet your safety requirements. This includes the lightest and smallest rotary buckles available, lightweight 3-point restraints, bulkhead airbag, seatbelt airbag and structural airbag systems. AmSafe will be exhibiting at NBAA. Join over 25,000 industry professionals for the most important three days of business aviation. Ranked as the third largest trade show in the United States, bringing together current and prospective aircraft owners, manufacturers and customers into one meeting place to get critical work accomplished. AmSafe is the world’s leading supplier of aircraft restraint systems, with the most technically advanced restraint safety systems available to help meet your safety requirements. This includes the lightest and smallest rotary buckles available, lightweight 3-point restraints, bulkhead airbag, seatbelt airbag and structural airbag systems.